To Dog With Love: Newest AKC/Eukanuba National Champion: London the Standard Poodle! Newest AKC/Eukanuba National Champion: London the Standard Poodle! I spent last week at the AKC/Eukanuba National Championship dog show, and all the fluffing, puffing and strutting culminated last night with the Best in Show competition. 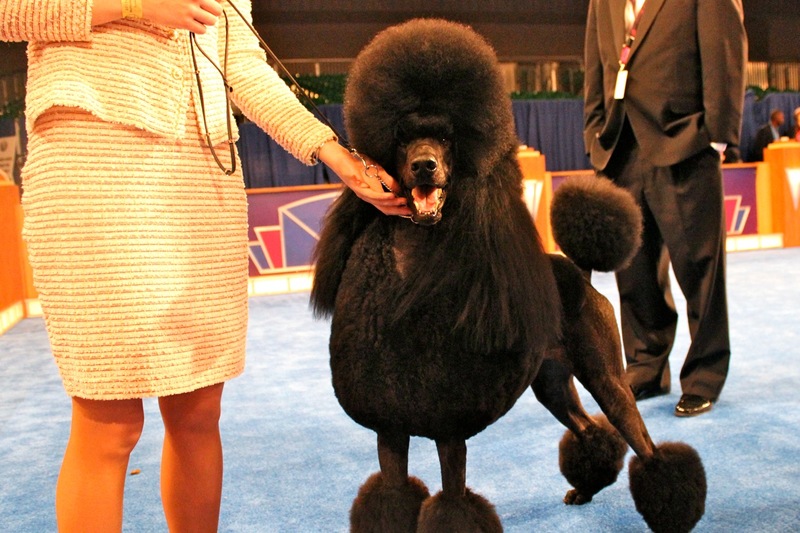 Top honors and $50,000 in prize money went to GCH CH Jaset's Satisfaction, a Standard Poodle known as London, owned by Beth Harris, Michele Molnar and Jamie Danburg of Palm Beach Gardens, Fla. It was a spectacular event, all the way around. The AKC/National Championship joined a range of canine sporting events all under one roof, including the AKC Agility Invitational, the AKC National Obedience Invitational and AKC Juniors competition in showmanship, agility and obedience. It's almost as big as I am! Wow! But even more impressive is how lovely and friendly London and his entire team are. London's owner Beth Harris says that London actually paces himself during the year by taking time off and enjoying his down time. He has his own Facebook page where it says he enjoys fetching Frisbees, playing with squeaky toys, swimming and chewing on bones ... sounds familiar! And you can find him on Twitter too, at @London_S_Poodle. Here, London gives us a big smile in the show ring after he was crowned. We also enjoyed watching the AKC Agility and Obedience Invitationals as well as the Eukanuba World Challenge and the junior competitions. Check out results from all the competitions here and on akc.org. Nearly 5,000 dogs competed for more than $225,000 in prize money. The AKC/Eukanuba National Championship will be telecast on ABC on Saturday, Feb. 4, 2012. Stay tuned about details of a viewing party on Twitter party where we'll get to relive all the excitement! got some ovегlapping issues. I just wanted to give you a quick heads up! website yoursеlf or ԁіd yоu hіrе someone to dо it for you? Τhank you, I've recently been looking for information about this subject for a long time and yours is the greatest I have discovered till now. However, what about the conclusion? Are you positive in regards to the supply? I'm experiencing some small security issues with my latest website and I would like to find something more safeguarded. Do you have any suggestions? it and return to learn more of your helpful information. aren't done payday advances depending about the severity of the financial hardships, these agencies may offer programs like debt consolidation loan, debt reduction, credit card debt settlement as well as perhaps even bankruptcy. possible once you may happen to be refused with an unsecured loan. So don't expose yourself to the chance of further losses by saying an excessive amount of quickloansmoouk.co.uk we offer personal loans up to r50 000 and bridging finance. our quick guaranteed loans you can help. ѕomeone witɦ ɑ little originality! clients, and they're already well familiar with celiac disease and gluten-free food.